Protection International has been working with the Malandi Human Rights Forum (MRF) since 2010. The objective of this partnership has been to contribute towards a safer working environment. The partnership has used various approaches, all designed to build capacity and help MRF members understand the risks resulting from their working environment and how to adopt a range of mitigating measures. When PI started working with the MRF in 2010, the organization faced a number of risks, including exposure to nuisance law suits, arrests, disappearances and marginalisation. At that point, the MRF did not apply security strategies systematically across all areas of its work, instead developing ad hoc strategies for individuals at risk or at times of vulnerability. Since initiating the relationship, PI has provided technical support to help the MRF develop a tailored security strategy, which has been integrated into its day-to-day activities: assessing their needs, running security training, helping to evaluate the strategy, networking on security, building community protection strategies, consolidating the court cases and networking with partners and other civil society organisations. The MRF has improved security management for members, information management and home security. Currently, the MRF engages in litigation, advocacy and other strategies in a safer manner – reducing risk for its members. Gitahi Githuku (PI Kenya’s Regional Programme Officer) and John Mwendwa (Malindi Rights Forum Coordinator) during a visit to the community in Marereni. 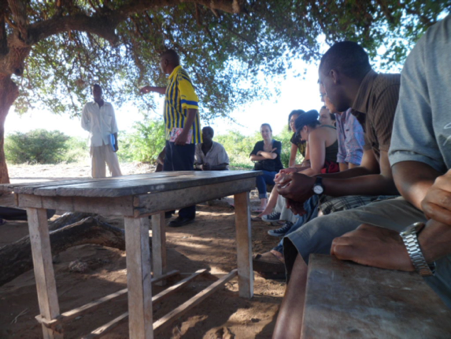 The MRF is a membership forum for individuals and community-based organisations working for human rights in Kilifi County in the coastal region of Kenya. Its secretariat is located in Marereni. The MRF works on issues concerning HRDs, indigenous people, labour rights, access to justice and children’s rights. Prominent amongst the human rights issues that MRF addresses is human rights and natural resources. In this region, known as the salt belt, large-scale salt mining companies have obtained huge parcels of land as a result of opaque deals, which appear to involve corrupt government officials. The process of salt mining displaces local communities from their most productive land. 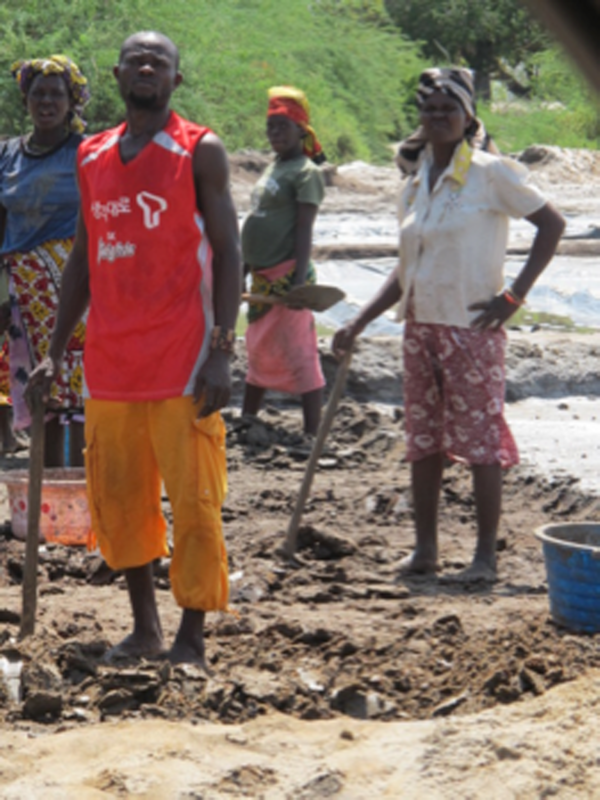 The majority of community members are peasant farmers, and without their land, they have few livelihood options other than working as casual labourers under challenging working conditions in the salt mines , for which they earn less than two dollars a day. When communities have demonstrated against the companies in the past, they have been brutally repressed, beaten and shot at by police officers who are paid by the companies to provide protection. The MRF works to empower the local community to address these rights violations. As human rights defenders, MRF members and staff have been the victims of arbitrary arrest, trumped-up charges, criminalisation and harassment. Small scale farmers unions have lost markets and other ways of generating income. In 2005, during a public inquiry conducted by the Kenya National Commission for Human Rights. The enquiry report outlined irregularities and documented some gross human rights violations. There was evidence of large differences in equality, with investors enjoying their rights while those of a community of 5,000 people were continually violated and their livelihoods compromised. HRDs were involved in preparing and participating in the public inquiry. The implementation of the recommendations of the report is ongoing. During the process various organisations realised they were working on similar human rights issues. They then decided to come together and form a forum with land as the main issue. Based on the evidence gathered during the inquiry and the litigation set in train as a result, MRF has come to the conclusion that the acquisition and ownership of some parcels of land by some companies is not only irregular, but illegal. ‘Illegal’ because land allocations to salt mining companies are not made according to the laws and regulations established by the government of Kenya. Additionally, the same companies continue acquiring f lands which are occupied by individuals. ‘Irregular’ because salt mining companies are obtaining additional pieces of land following the forced eviction of individuals. Some of the land owners have not received just compensation for their homes, property and land - with some of them losing as many as 300 productive cashew nut and coconut trees, which were destroyed by tractors. The salt companies have acquired thousands of acres of land - some of which remains idle. For example, KEMISALT controls more than 9,000 acres, which has remained idle since the eviction of the community in 2001. These displaced community members are suffering injustice and hunger and are not able to engage in their traditional agricultural activities. They have been reduced to the status of landless squatters living across the road from the now unproductive land they used to farm. Over the years MRF has attempted various forms of intervention, such as discussions with investors, raising community awareness and engaging in public interest litigation. One of these cases has been filed and is currently being heard by the courts; the status of another case involving the company Krystaline case is currently uncertain. MRF is also attempting to revive the KURAWA case. fishing and never returned. Additionally, some relatives of HRDs have been denied employment opportunities despite being qualified for the work they have applied for. One of the MRF’s members, Joel OGADA faces three court cases, facing what the organization considers to be trumped-up charges; in a further case his wife was arrested on his place. He has also been arrested several times and faces police harassment, probably because he has refused to give up his land. The Marereni community is also suffering as a result of environmental degradation because many of the trees have been cut down, and waste from the factories effluent flows into the waterways used by the community. Over time, the pollution has killed fish - decreasing stocks drastically, making the water unfit for human consumption contaminating the soil. People working in the salt mines are not well remunerated and work under hazardous conditions. There are suspicions that some illnesses suffered by members of the community are the result of working in the salt mines. To mitigate these conditions the MRF is planning to form a trade union to represent people working in the salt works. Currently they are facing the challenge of getting all the workers together, because they fear reprisals. PI has been working with the MRF since 2010. The objective of this partnership has been contributing towards a safer working environment. The partnership has seen various approaches intended to create a safer working environment; it has involved various approaches, all designed to build capacity and help MRF members understand the risks resulting from their working environment and to adopt a range of mitigating measures. This process was intended to change attitudes towards security management and with it, alter behaviour. When PI started working with the MRF in 2010 the organization faced a number of risks, including exposure to nuisance law suits, arrests, disappearances and marginalisation. The MRF did not apply security strategies systematically across all areas of its work, developing ad hoc strategies for individuals at risk or at times of vulnerability – e.g. hiding members at risk, contributing to bail, etc. Since initiating the relationship PI has provided technical support to help the MRF develop a tailored security strategy, which have been integrated into its day to day activities: assessing their needs, running security training, helping to evaluate the strategy, networking on security, building community protection strategies, consolidating the court cases and networking with partners and other civil society organisations. The MRF has improved security management for members, information management and home security. Currently, the MRF engages in litigation, advocacy and other strategies in a safer manner, with reduced risk for its members. Previously, the MRF organised demonstrations, in which some of their members were injured and others disappeared. This way of operating had dangerous consequences affecting individuals and failing to achieve the intended outcome. Now, it runs various schemes safely, including harvesting salt independently from the mining company; this provides income for many people. This empowerment also helps the MRF cover the legal costs of the many legal cases it pursues. It is also able to engage with various stakeholders, sharing the risks and implementing collective deterrence strategies. Over the last few months of 2013, the uncertainty in the Magarini Salt Sector declined following the intervention of high level duty bearers. The MRF has been able to engage state actors, community organisations, independent bodies, the legislature and media to raise awareness of the situation in the region and of its network. On Saturday 8th February 2014 the Chairperson of the National Land Commission (NLC) visited the Magarini Salt belt on a fact finding mission during which he addressed a large public gathering at Marereni as follow up to a petition the MRF had presented to him in December 2013. In a nutshell he admitted that illegal land allocations had been made across the whole country and that the salt belt is not an exception. He took time to explain the phenomenon of absentee landlords, which is a widespread issue in the coastal province as a result of its colonial history during which, over six centuries the region has been colonized by five different groups (the Arabs, the Portuguese, the Germans, the British and now the Kenyans) with each successive authority enacting its own land laws. He assured the public that the NLC has been vested with powers to resolve all the historical and ongoing land injustices. To this end he said that the NLC had already identified a TASK FORCE, which would be soon be published in the official gazette to enable work to start. He was categorical that the land issue in regions including the Magarini salt belt would be resolved by the end of the year, accepting that land issues are very complex and emotive in the country and need to be handled with care, given that many of them date back many years. He promised to stop the activities of the Krystaline Salt Works at Marereni. The MRF now enjoys greater recognition in the community and is therefore able to achieve more on the human rights front. Human rights challenges and insecurity still exist, but they are being analysed and mitigated. PI has seen the MRF apply protection tools and strategies over the period of engagement. But it is not direct action by PI that has changed the security situation of the MRF. PI has helped develop and mainstreaming strategies, but the work has been carried out by the MRF, though it still calls on PI for technical support on various issues and for analysis.